A new documentary film directed by Brian Malone, takes an unbiased look at partisanship and asks: how did it get so bad? The politically charged documentary drills down to the roots of political polarization, examining both parties' tactics, the division of Congress and the role that the media plays in dramatizing events and offers solutions to move beyond it. LOS ANGELES (June 19, 2012) - With the widening political divide so evident this election cycle, Patriocracy , a new documentary film directed by Brian Malone, takes an unbiased look at partisanship and asks: how did it get so bad? The politically charged documentary drills down to the roots of political polarization, examining both parties' tactics, the division of Congress and the role that the media plays in dramatizing events and offers solutions to move beyond it. Malone documents the decay of political pragmatism with candid insights shared by CBS Correspondent Bob Schieffer, former U.S. Senator Alan Simpson, Newsweek political reporter/Contributing Editor and McLaughlin Group TV pundit Eleanor Clift, news commentator Pat Buchanan, the "Gang of 6" Senators Kent Conrad, Mark Warner and Mike Crapo. 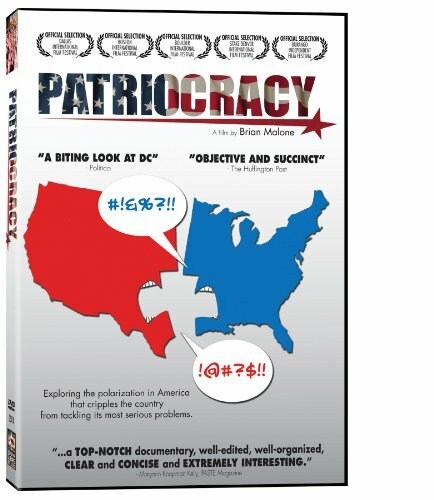 Patriocracy will be available on DVD and digital download platforms on July 17, 2012. Dorchester native and five-time Emmy Award winner Malone examines this toxic environment by reaching across the political aisle in search of a grand rapprochement among the feuding factions in American politics. Malone documents the rise of partisanship; sarcasm and a "gotcha" mentality that has undermined what Malone believes are tenets of effective government: civility, conversation and compromise. The film takes us behind the scenes of a Congress trying to legislate in this climate in which votes are ranked by interest groups for ideological purity and a lawmaker can't face his or her constituency, or the media's cameras, without pressure to take sides. Malone makes a subtle but important point when he observes the increasing estrangement of legislators from one another. As more and more legislators commute to Washington D.C., rather than residing full time, the community has become even more fractured. The days of friendships and socializing across party lines have ended--party identity prevails. Instead of working together to figure out solutions to the issues of the day, e.g., national debt, healthcare reform, illegal immigration, the war on terror, Americans of both parties are shouting at anyone who does not take their side. In this day and age, those who yell the loudest and instill the most fear into the general populace are the ones whose message overshadows one rooted in logic and backed by facts. Simpson, along with former Oklahoma Congressman Mickey Edwards and others, makes practical proposals for the American electorate and our legislators: seek news from a variety of sources, lower campaign costs, open primaries and forego party allegiances, thus paving the way for more independent thinking. Malone says, "We live in a hyper-fast, hyper-partisan climate fueled by a 'me first' perspective and lightning fast media. The dark side of that self- centered position is that America as a whole is suffering. So, really the problems we face in America come down to our state of mind. I do believe that there needs to be more 'we' and less 'me.' We do have some very big problems to solve in a short amount of time. And 'we' need to base our decisions to fix these problems on well-researched and credible facts, rather than emotions and opinions."